I’m really good at starting projects. It’s the “finishing” them that I have a hard time with. Are you like that?! It’s fun to start a project. You’ve got momentum and are excited to transform something from the basic blah that it currently is. The problem is, once the project is *almost* done, I have had my fill of it and just don’t want to finish the last 10%. And so I move on to the next exciting project, ready to transform something else. I’m not starting any new projects until this list is finished! So, bear with me as I go over my overwhelming to-do list. This is me declaring to you that I’m going to finish these projects! And now, in no particular order, here are the current partially finished projects I’ve got going on in the house, and what I need to do to finish them. I’ve tried to organize them room-by-room, so I’ll start with the dining room. 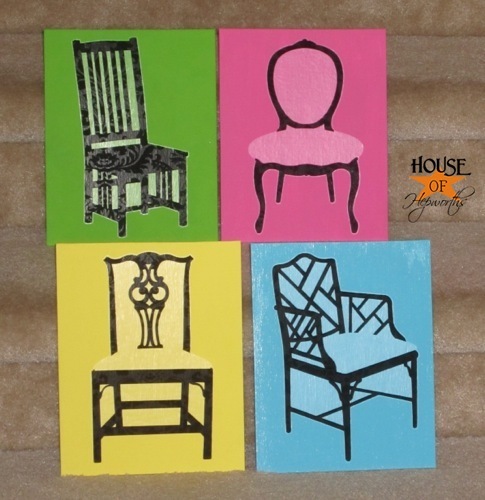 Finish all 10 dining chairs. 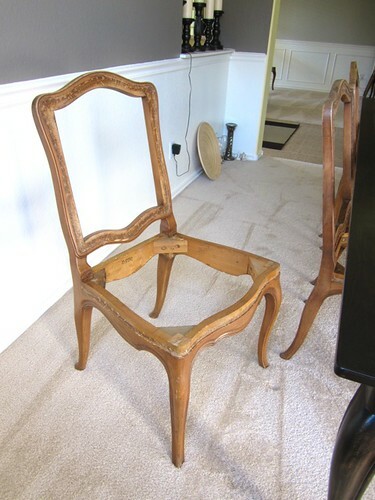 c) and finally, upholster them. DONE! You can see the awesome curtains here. I was originally going to copy Thrifty Decor Chick‘s centerpiece, but I’ve decided to go a different direction. Now I just need to finish it. They’ve already been purchased. Now I just need to actually hang these long floating shelves along the long wall in the dining room. Mostly DONE! You can see the updated post here!! I’ve had this shelf for years. I painted it white for my son’s bedroom when he was a baby, but when he was about 3 he took a sharpie to the entire shelf. 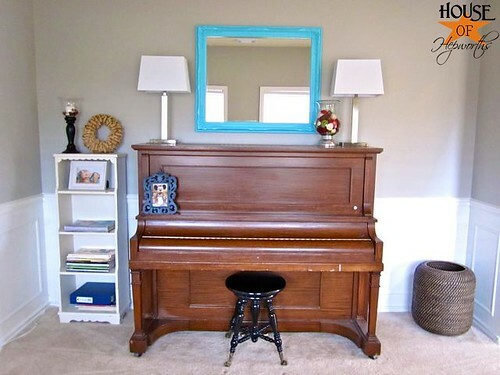 Now I need to give it a new coat of paint to fit into the Piano Room space better. The lamps were a score at Goodwill months ago, but have a little rust damage on them. I need to pick a color then paint them. When we purchased our very first home, the only thing I wanted was a plate rack; and I bought one. I’m not so obsessed with it anymore, but I still like it so I plan to hang it on an obscure wall to show off my Astrology plates I picked up at Pottery Barn years ago. 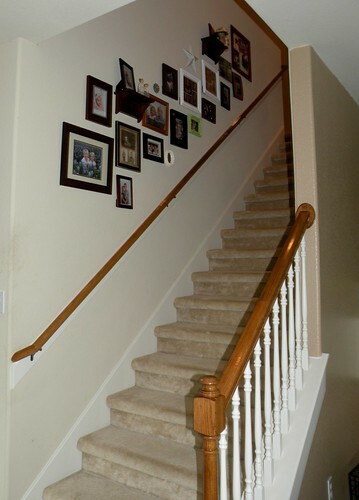 Make and frame large family portraits for long neked wall. DONE! You can see the updated post here!! Lucky for me I’ve already started this project, otherwise I’d have to put it off. I can’t wait to fill that big blank wall with large portraits of my family. I’ve got other ideas for the room as well, but for now, I must finish these projects first. Finish hanging the chair rail around the entire room. 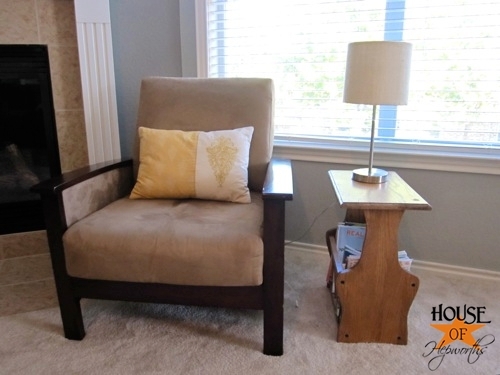 I had some leftover chair rail from the Dining Room project, so I added what I could to the family room. Now I have large gaps where more chair rail is needed. It looks pretty ridiculous and I’ve lived with it half finished for long enough. DONE! Check it out here!! 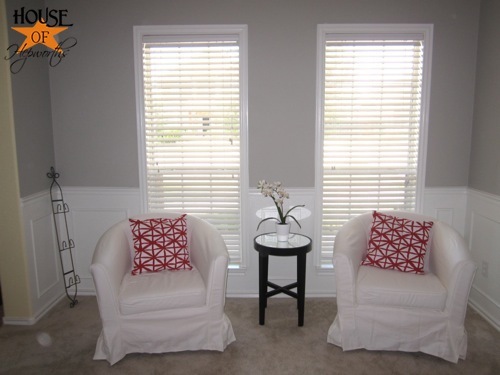 When I hung the random chair rail pieces, I also added moulding around all the windows. Well, here they sit, months later, just begging to be painted. I picked up this ugly side table on Craigslist when we first moved here. I’m hoping that a coat of paint will make it a little easier on the eyes. 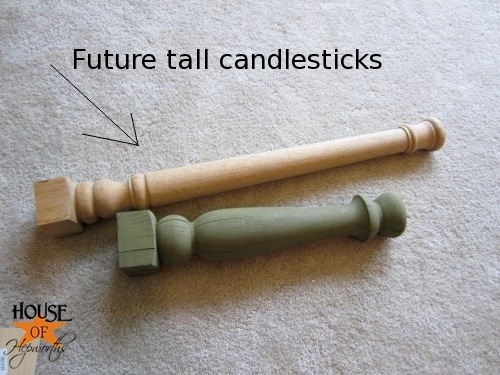 I started these candlesticks when I lived in Beverly Hills. That was a year and a half ago! All they need is a top plate and a coat of spray paint. Why have I never finished them? It should only take an hour at most, so why have we been here a year and still haven’t done it? Well, I’m making it a priority to get ‘er done once and for all. And finally, here are the ample other projects I’ve got going on around here. Finish sheetrock in master closet. Remember a long time ago when we had that flood? I know it’s hard to remember, considering we haven’t even had rain in months. Well, that flood came through the ceiling in our closet. I’ve got the sheetrock hung, now I just need to tape and float it, then add texture. Grumble. Replace light fixture in foyer. 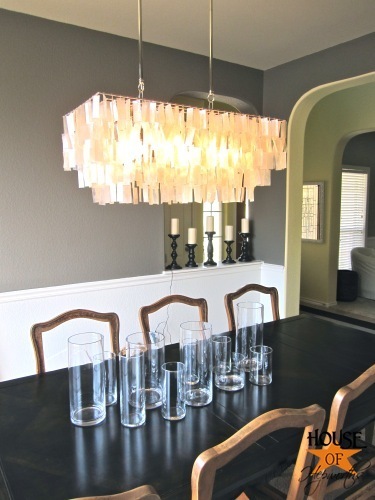 Just the other day I pulled down a perfectly decent chandelier in my Dining Room and replaced it with my new Capiz one. 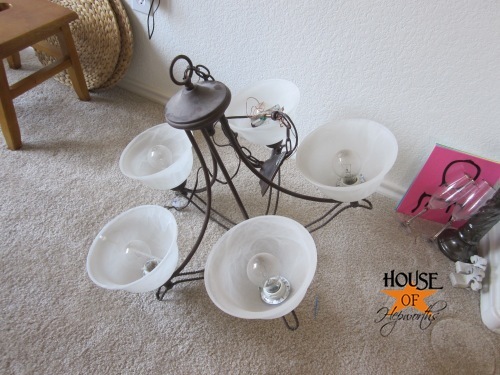 Well, that old chandelier is still pretty dang nice, so I’m going to give it a new life and hang it in our foyer. Don’t be surprised if you see the current little one pop up somewhere else in the house eventually. Yes, it’s embarrassing. 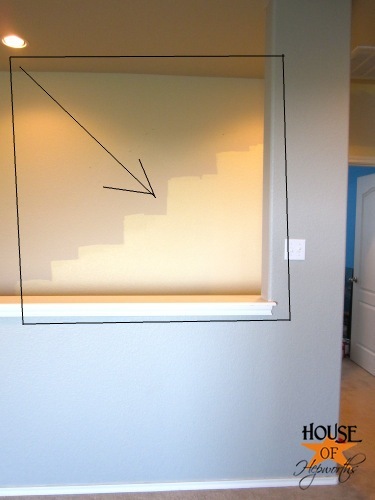 I still haven’t painted the 2nd story of our foyer. I can’t reach that high and I’m waiting on something (or someone) that can help me out. Same deal as the foyer. I can’t reach the top part of the wall, so I just painted as high as I could go. The stair step look is the new black, you know. Finish updating the stairwell gallery wall. I’ve taken down all the frames and am painting them white. Plus, I want to add a few new frames to the mix. Hopefully when I’m done it will look more cohesive. 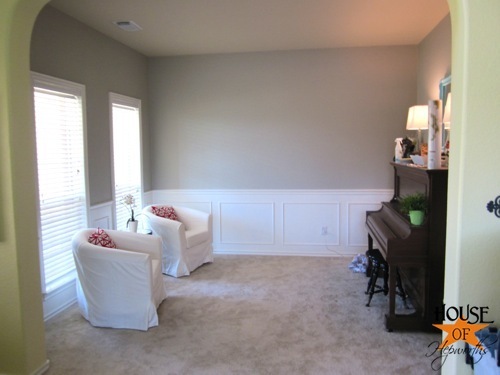 Spackle and paint corner wall in Game Room. This was a total disaster. 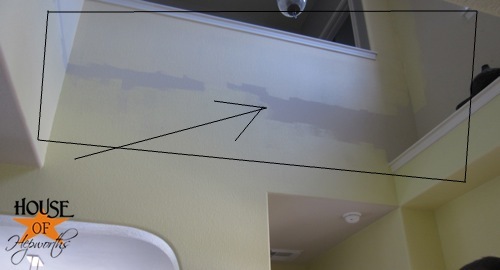 I had some issues with letting the paint dry to much on the tape edge, but not enough to be fully cured, so when I pulled the tape off, it took most of the sheetrock with it. Now I’ve got to spackle the edge and repaint. Replace light bulb on front porch. How dumb that I have to actually put this on my to-do list! I can’t reach the bulb with the step-stool, so replacing the burnt out bulb is going to require busting out the big daddy ladder. I need to just DO IT. It’s been burned out for a few months now. Finish the King Size Headboard project. DONE. You can see the finished headboard HERE. I have this headboard that’s getting a royal makeover. I can’t wait to show you and tell you all about it… once I actually finish it. It’s only been half finished for a couple months now. Jessica from Craftily Ever After made me a printable about a year (yes, that said YEAR) ago of all our previous addresses we’ve had since we tied the knot. It’s finally printed and framed, now it’s just waiting to get hung. Maybe tomorrow? So there you have it. My list of 24 things I wish I’d completed sooner. Should I walk on the wild side and give myself a deadline of December 31, 2011? Is it even possible to finish all these things in just a little more than 3 months?! How many items do you have on your half-finished to-do list? Please tell me there are others out there who procrastinate as much as I do. I’m not going to beat myself up for letting these projects get so out of hand. I’m just going to start today and finish them. Ha ha! I’m so like you, I start but don’t always finish. 🙂 You gave me a good idea for a post, although my mother will roll her eyes. I’ve been a “non-finisher” for so long! 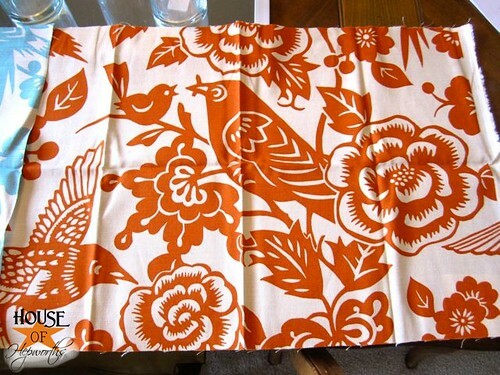 This is called this “Project ADD”, and I suffer from it as well… I vote for starting with the orange print curtains. Cant wait to see them hanging! You’re list inspires me to make my own and really see what needs to be done – sometimes just looking at it makes you realize that some could be ticked off the list so easily! We need a club – Finish Procrastinators Anonymous. I’d be a charter member. It’s always so fun to start, and then you realize it’s actually work, and suddenly you’re over it. Three years later, you move a piece of furniture and remember you forgot to get around to painting behind it. Huh. I was counting today and I have 18 unfinished projects right now. I love starting projects. It’s so fun, but finishing is sometimes a challenge. Thanks for the inspiration. I’m just going to get started and get them done. Do you want to come help? whew! what a list! it just kept going and going and going…but i loved seeing that i am NOT the only one with a list a mile long! if you even get half that done by that deadline, i will be impressed! you are one ambitious lady and i can’t wait to see some of your finished projects!!! Wow, and I thought I was the only one out there with half baked projects! 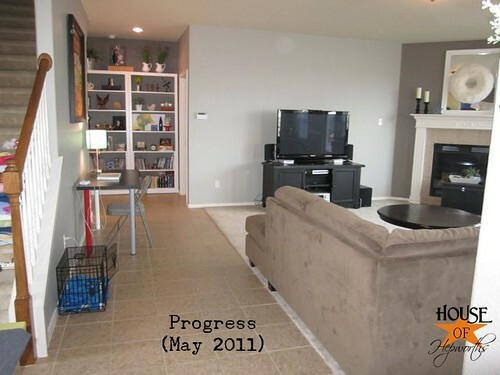 I have floors and painting to finish as well as several other ‘started’ projects. Good luck on your list Allison!! I’m scared to start making my half way done list. Thanks for this post! I’m gonna commit RIGHT NOW to finish all existing projects before buying ANYTHING new for projects! I get all projects about 90% done then get bored (or get a new idea!) and start more! AHH!! I need to do a post like this to get my bootay in gear! oh, you don’t even want to know how many things are on my “to finish” list!! I’m sure it’s more than 24!! I started to make a list once, but it just got waaaay, way to depressing, lol! Soooo like this! I recently made “the list” and decided to start with everything that I can do for free, or have all the materials for. Much less daunting that way. Oh I can’t tell you how happy I was to read this post tonight! 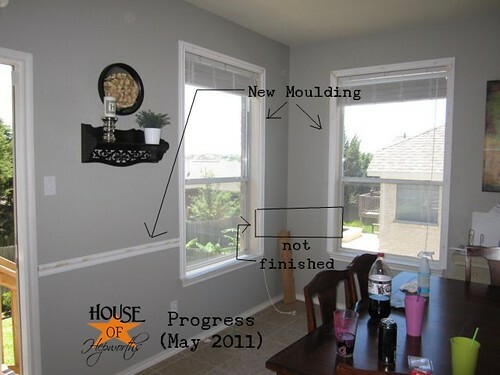 I am so, so glad I am not the only one who does this…the getting all gung-ho and starting 500 projects around the house and then never finishing them!! I too am ashamed to say that I have FIVE burnt out light bulbs that need to be replaced – that would be two on the front porch, one inside the front door (why yes it is easy to see when I come in after dark with EVERY light within reaching distance of the door burnt out! ), the back porch light (so no sense going to the back door cause can’t see there either! ), and a hall light inside the house. In all fairness these all burnt out this summer when I was away for several weeks and left them all one but still! I have been back SIX weeks now..high time they were replaced eh? And I too need to get the ladder out for all but one of them. Thanks again for making my day! Love your blog. My list is way longer, lucky. @Jenni Roseland – love the Star Wars reference! You could totally bust these out! Maybe grouping things together for goals to get done in one day- like several smaller projects- enlist your husband! I’ve been working on my own half finished projects too- and yes, it is WAY more fun to start them than to finish all the way most of the time…. Project ADD… got that right!! and there’s always too many cool new projects to try. You can be called guilty of enabling, you awesome crafty lady- since you come up with so many fun things to try 😀 . Holy macaroni girl! I bet I can come up with twice as many LOL I’m seriously in your procrastinator club too! Now I’m sitting here thinking about my list and if I have the guts to actually photograph ALL of them and make a post too. 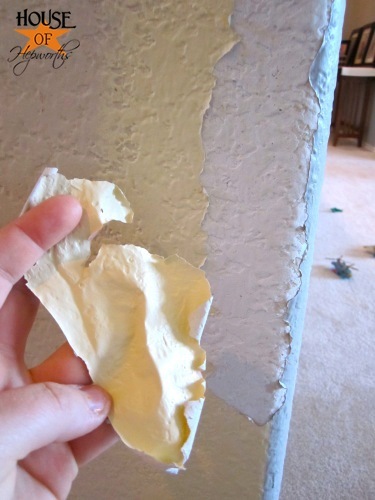 My favorite one here is “trim bedroom paint” that was done *cough*two*cough* years ago! Now I’m ready for a different color! hehe Keep it real and keep it coming! Love to you darlin! This is the way I was feeling back in May/June. I did the same thing – I sat down and made a list and starting working on it. Now, my list only had 11 things, not 24! But I got it done in 2 1/2 months. It’s so much more inspiring to see it written down and slash it off as you go. And besides, I just counted off four things on your list that you could probably do in a day (or less!). You can do it, girl! you’re awesome 🙂 thanks for sharing this! 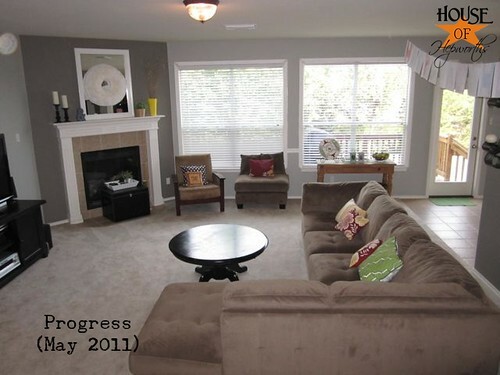 we have those same windows (without trim) and i’ve been searching high and low for a solution! you just made my day! I am sending this post to my husband. Thank you for proving that I am not the only one with projects that need to be completed. 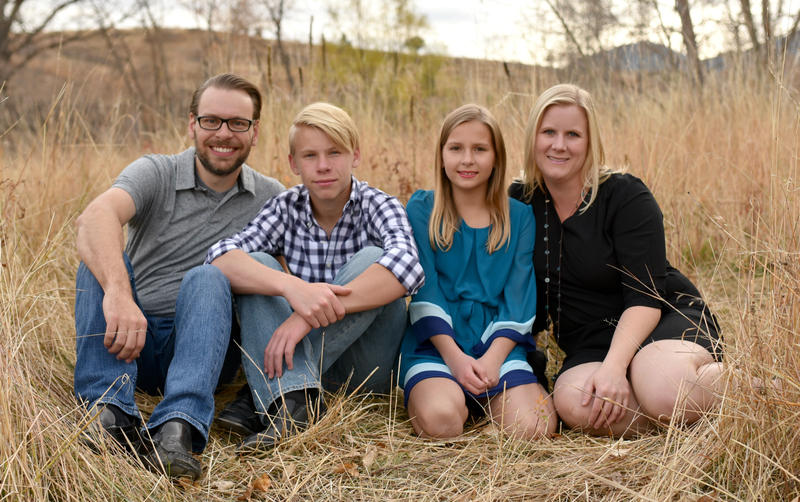 Sometimes when I read a blog I feel so inadequate because it seems like I am the only one who can’t keep up with things but this post helps me to know that I am not alone! I have so many projects started and not finished that it is just sad…and some of mine aren’t nearly as big as yours! I had to go back to work full time after my husband lost his job so I have such limited free time to things since I do my best to make my little family my number one priority. Maybe I should make a list of a few and try to tackle them one by one…..every little step helps, right? Good luck with all of yours. So far everything you have completed looks fantastic. Wowza – you have quite the to-do list! 🙂 It all looks like it’s going to be fun/turn out great, though. 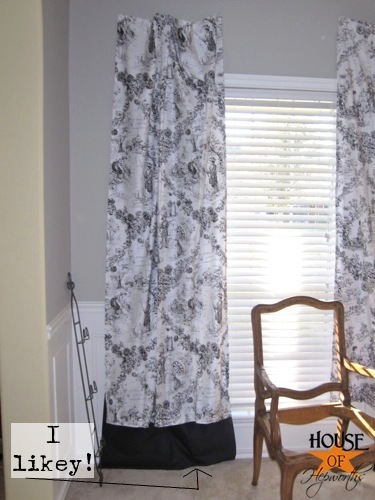 I absolutely LOVE the fabric you’ve chosen for the curtains. It is SO cute. Aw, Allison, you’re my she-roe! You had me when you posted about depression (Thank You!) but now I’m totally hooked! I don’t dare make a list. I’d have to find my blankie and crawl in bed, I fear. It’s much more fun to read about someone else’s projects! You just crack me up Allison! I love reading your blog! I was just thinking about all the projects that are almost finished in my house. I think every single room has something that needs to be done! I feel so overwhelmed and don’t even know where to start! It’s nice to know that I’m not the only one that does this!! Actually, I’m impressed with just how much you HAVE accomplished in a year! And yes, I have too many UFOs to count. First up, repaint the kitchen. Shrek green was exciting, but clashes with the new flooring. Eeek! 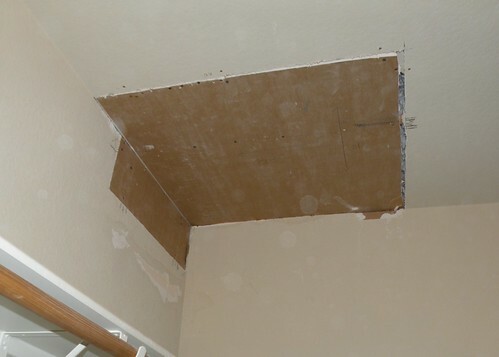 Then, the bedroom wall, which was damaged taking down shelving. Please keep up the blogging. You give me the courage to continue on my own decorating journey. GJ-about 50 miles south of you! We have a similar list too! Well, I think there are a lot of great “afters” in your future! Oh girl you crack me up! We all have the unfinished projects lol. And can you puhlease paint that side table yellow? Like the sunniest day yellow?! I would love it. Congrats for getting motivated!! Thanks for sharing your fail list with us. Now I can stop the self flagellation for not finishing all of our projects! All of us crafty people have finishitis! Holy cow! I have a pretty long list, too. My husband calls me the Queen of I Was Gonna (hence my blog name). I usually get a new idea before I’ve finished my current project and lose interest. Don’t worry about it…I’ve prolly got 50…and then there’s the pile of ones I haven’t even started! Whew! You make me tired just reading about your plans! How awesome, though, that you have the creative mind to see the visions. Good luck! I have so many unfinished projects, too. I can totally relate. I even start new ones if I think I can get them done right away. Sometimes I can, sometimes I just end up making my to do list even longer. And so it goes. Here’s to making progress – there’s always tomorrow, right? 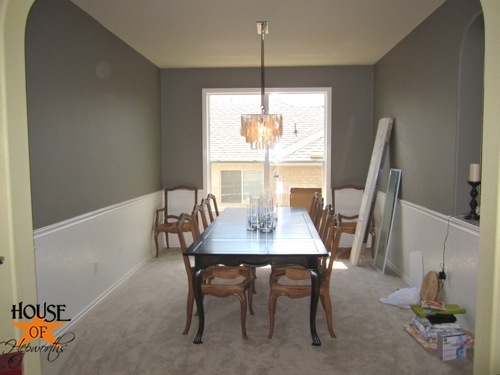 PS – Love the paint color in your dining room. So I was thinking about my list last night and wrote it all down… it is SCARY! lol I numbered my list as I went along and decided on a plan of attack. I’ll use the very old fashioned method of pulling a number out of a hat! I may or may not use an actual hat 😛 The project that corresponds with that number I pull is what I’ll tackle each time, 2 a week is my goal. We can do this!!! LOVE love love your blog girly, keep it comin’! Wow, you are so brave to actually put your list on your blog! You have no fear! And keep it so real. I think that if you set your goal to finish just one you will really feel good about the rest of the list. Don’t even get me started on my list, I don’t have the backbone like you to put it out there, but it is just as long. Oh my. I have the same syndrome…and it just got longer after looking at some of your cute ideas! Curses! I love this list! 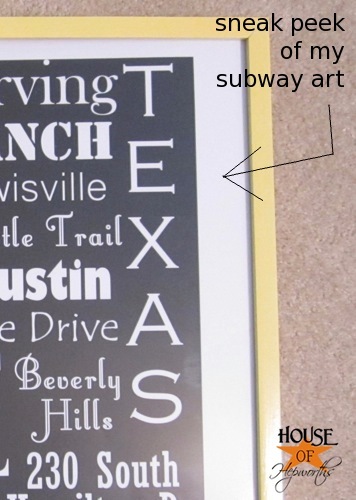 I need to make one for myself. . .and, like you, many of my projects are just “it will only take an hour” and others require help and/or days/planning. But your list is so detailed that I’m sure you will get it all done. Thank you for the inspiration!